There’s a new bar and restaurant in town or at least in Better Living, Parañaque. It’s called Sawsawan and I’ve had the chance to makisawsaw recently. Sawsawan is a Filipino word for dip. Most grilled and fried dishes in the Philippines are served with accompanying dips. Some of which include soy sauce or vinegar often spiced further with garlic, onion, and calamansi juice. The open area design is effective considering the breezy wind typical of this city, particularly at night. A huge aquarium close to the service bar section is also an attraction. The aquarium is no longer present, or doesn't have any fishes at the moment. There's a stage where guests can perform now and the overall ambiance is so much better. Light and heavy drinks are served along with Pinoy and foreign dishes. You’d also find typical grilled food offered on the menu. 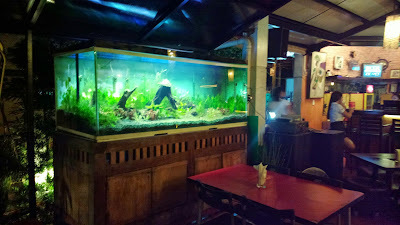 Plus, the prices are very affordable including drinks which are normally overpriced in similar resto/bars. If there is any resident chef or cook/s, I'd like to commend them. The food selection is definitely an upgrade from the older menu from years back. The crispy, thin-sliced deep fried pork is my favorite. Sawsawan is located at 21 Russia St., Better Living Subd., Don Bosco, Parañaque City.